It would be easy to be flippant about the starting five on Kentucky’s national championship basketball team all declaring for the NBA draft, in unison, on Tuesday. You could mock coach John Calipari for building his program around one-and-done players, you could raise an eyebrow at noted NBA power broker World Wide Wes’ presence at the NCAA tournament final as an obvious UK fan. 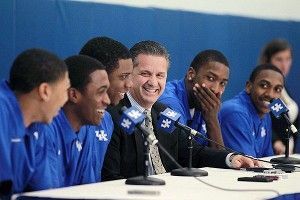 Or you could just see the shared elation on the faces of Anthony Davis, Michael Kidd-Gilchrist, Terrence Jones, Doron Lamb, and Marquis Teague, and let these guys live a little. I defy you to read this Kidd-Gilchrist quote and begrudge these guys a single thing in life: “I want to spoil my mom. I think I’m going to spoil my mom to death. That’s one thing I’m looking forward to.” They earned it. All of them. 2. Proponents of Goal-line Technology in Soccer: GOOOOOOOAAAAALLLLL? Brian Phillips would like to point out Juan Mata’s goal/not a goal in the FA Cup semifinal between Tottenham and Chelsea, because somehow in the world’s biggest sport we are still relying on guesswork. Just ask Frank Lampard! Throwback to what, exactly? When the earth was ruled by bees? Or put it on a ring. You know, as a Phillies fan, I can’t even pretend like I’m even remotely OK with this vile creature yet, but Larimer really wanted it on here. The rally squirrel got itself carved into the St. Louis Cardinals World Series ring. Good for the Rally Squirrel. The Dodgers catcher started a real keep-your-head-on-a-swivel play to get the Padres all out, all at once, on Sunday. But as to what is in his ears, you’ll have to ask Delonte West. Seriously, I feel like, all things being equal, Gordo handled this … pretty well? Is there an obvious reaction to have when Delonte West gives you a “wet willy”? “I wanted to fight right there, but you can’t do that,” Hayward said. Cooler ears definitely prevailed here. When asked who he thought should start for the Jets at quarterback next season, the Patriots’ defensive lineman had a very simple answer: “ Tebow.” What’s up, Mark?